Uphill skiing has become more popular with the advancement of Telemark and AT ski gear. Alpine Touring and backcountry gear sales were up 36 percent last season, while traditional gear sales were down according Snowsports Industries America. 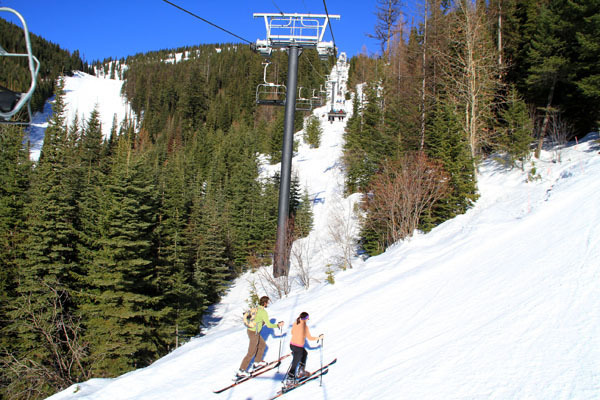 More skiers and adventurists, a 25% increase, are enjoying the exercise of climbing up the ski mountain for their turns, even though the AT equipment is designed for touring outside of groomed ski resorts. With this explosion of inbounds excursions, downhill skiers and ski resorts have had to adapt, set and enforce policies, to avoid accidents. Ski areas are private businesses, and they spend serious money snow making, maintaining and manicuring their slopes, and insuring the safety of skiers and riders using their terrain. A random uphill skier in the middle of a ski trail can create serious risk to oncoming downhill traffic, a skier, snowboarder, or mountain operation snowmobile or grooming machine. Uphill skiers may claim they have minimal impact on ski areas, and that they should be allowed to free heel at their free will, particularly when the ski resorts are located within public Forest Land. However the inbounds terrain is privately managed within the lease from state or US forest service. Many ski resorts are adopting Uphill Skiing Policies to mitigate potential collisions on the mountain. Some resorts only allow uphill skiing on designated trails, during or prior to the lifts opening, to reduce risk of colliding with grooming vehicles. Other ski resorts are requiring uphill skiers to purchase a ticket, generally far less expensive than a lift ticket, $10 at Sunday River and Sugarloaf for example. By going to the ticket window for this uphill climbing ticket, the skier checks in with the resort, accepts responsibility and is made aware of on hill policies. Sugarbush has specific policies, spelled out when you register for a free Uphill Pass, including they do not allow dogs to accompany uphill skiers. Big Sky and Whitefish in Montana restrict uphill skiers to two trails, and specific hours, and strictly prohibits these skiers from being within a designated distance of groomers and snowmaking equipment. If you like the exercise and freedom of uphill climbing for your turns, check with the ski resort before you start skinning. Pay the fee if there is one, stay to the side of the trail, single file, and wear colors that make you visible to oncoming traffic. Access to terrain at a ski resort is a privilege not a right. You may only travel on terrain that is designated as open for uphill climbing . You must ensure that you are visible to downhill traffic at all times. You may not leave the resort property to access the backcountry. You may not ski down the mountain prior to lifts opening at 9 a.m. midweek or 8 a.m. weekends and holidays. Ski Patrol clears the mountain of all guests and staff at the end of operating hours every day. If you are on the mountain at this time you will be required to ski down. Ski Patrol reserves the right to close the mountain to these activities at any time due to severe weather, dangerous surface conditions, or other factors. Sledding is not permitted on any part of the mountain at any time.